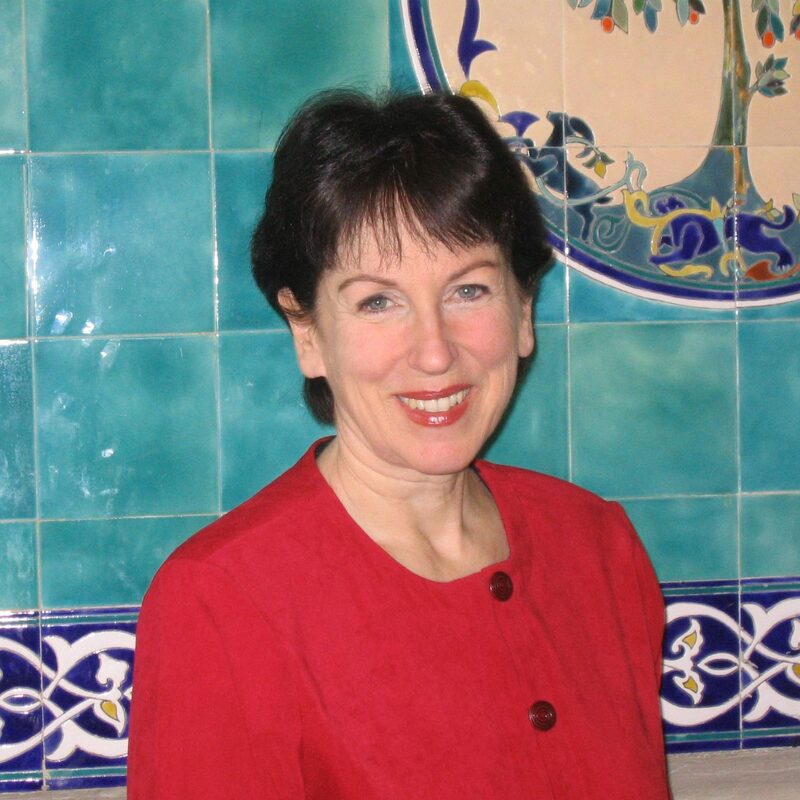 Biography: Claire Ruth Pfann is Academic Dean and Instructor in New Testament at the University of the Holy Land in Jerusalem. She received her Master of Arts in Bible from the Graduate Theological Union in Berkeley and has studied for the Ph.D. under the direction of Prof. Michael Stone at the Hebrew University of Jerusalem. She is a popular lecturer for short-term study groups coming to Jerusalem, speaking frequently on the Jewish world of Jesus and the earliest Christians, women in the Bible, and society and daily life in New Testament times. She has been featured in numerous television shows and documentaries on CNN, CBN, the BBC, and the History Channel. Mrs. Pfann worked with Prof. Emanuel Tov, Editor-in-Chief of the Dead Sea Scrolls Publication Project from 1991-1997, serving as the Production Coordinator for Discoveries in the Judean Desert (Oxford University Press), the official publication series for the Dead Sea Scrolls. With her husband Stephen, an editor of the Scrolls written in Cryptic (or esoteric) scripts, she is producing the Comprehensive Concordance to the Scrolls as well as a web-based, Multimedia Educational Suite on Qumran and the Scrolls. She is a contributor to the newly revised Encyclopedia Judaica (2006). Her most recent publication is “A Note on 1Q19,” in M. Stone, A. Amitai and V. Hillel, eds. Noah and His Book(s) (SBL, 2010). With her husband, she wrote and compiled the database for the CD-ROM From Nazareth to Jerusalem: A Disciple’s Diary, and with the staff of the Center for the Study of Early Christianity, she contributed to the CD-ROM Christian Pilgrimage to the Holy Land, produced for the Ministry of Tourism of Israel by UHL/CSEC. In addition to her teaching and administrative duties, she is a member of the research team and content advisor for the Nazareth Village, a historical museum experience in Nazareth which recreates Jewish town life in the first century AD based on literary and archaeological sources and contemporary ethno-anthropological studies. A native of San Jose, California, she has made her home in Jerusalem for the past thirty- four years together with her husband of thirty-nine years Stephen. Visiting Graduate Student, Hebrew University. Course work in the Departments of Ancient Semitic Languages, Bible, and Archaeology, 1982-1983. B.Th. Northern California Bible College, San Jose, California, 1978. Major: Bible. Santa Clara University, 1971-1972. Reading knowledge of Hebrew, Aramaic, Syriac, Ugaritic, Koine Greek. Studied for purposes of comparative linguistics: Modern Egyptian. Production team, accountant, and database in-put Chrisitian Pilgrimage to the Holy Land (UHL/CSEC and Israel Government Ministry of Tourism, 1998). Co-author (in collaboration with Click! Multimedia, Inc., Tel Aviv, Israel), From Nazareth to Jerusalem: A Disciple’s Diary (Palphot and Thomas Nelson/Word, 1996). Contributor (in collaboration with Click! Multimedia, Inc., Tel Aviv, Israel), The Illustrated Dictionary and Concordance of the Bible (Bitan, Pub., in press). Review of In the Master’s Steps: The Gospel in the Land (The Carta New Testament Atlas, Vol. 1) by R. Steven Notley (Jerusalem: Carta, 2014), BAR 41 (2015) 68-70. “A Note on 1Q19” in The Book of Noah, M. Stone, A. Amihay, R. Clements, eds. (SBL, 2011). “Popes,” Encyclopedia Judaica Second Edition (New York: Keter and Macmillan Publishers, 2006). “Protestants Encyclopedia Judaica Second Edition (New York: Keter and Macmillan Publishers, 2006). Contributor, The Comprehensive Concordance to the Dead Sea Scrolls. 1997-present (Eisenbrauns, in preparation). Production Editor, Discoveries in the Judaean Desert XXVII (Oxford University Press, 1997). Contributor, The Illustrated Dictionary and Concordance of the Bible, Jerusalem Publishing House/MacMillan Press, 1986. Contributor, Hebrew University Bible Project: “The Alignment of the Aramaic and Greek Texts of Ezra and Daniel,” 1982-1983, Prof. E. Tov, Project Director. Ph.D. Hebrew University of Jerusalem; Department of Ancient Semitic Languages (2001). Dissertation topic: ‘The Character of the Essene Movement in Light of the Manuscripts Written in Esoteric Script from Qumran.’ Program Director: Prof. Michael Stone (formerly under the direction of Profs. Jonas Greenfield and Moshe Goshen-Gottstein). Visiting Graduate Student, Hebrew University (1982-1983). Course work in Departments of Ancient Semitic Languages, Bible, and Archaeology. B.S. Bethany College, Scotts Valley, California (1972-1974). Majors: Bible/Theology; Preseminary. A.A. De Anza College, Cupertino, California (1970-1972). Major: Liberal Arts. Studied for purposes of comparative linguistics: Coptic, Middle Egyptian, Classical Arabic, Ge’ez, Akkadian, Latin. Grant recipient, Shelby White-Leon Levy Foundation for Archaeological Publications, for the Annotated English Edition of The Excavations of Qumran and Ein Feshkha, 2000. Endowment for Biblical Research Fellow, Albright Institute of Archaeological Research, Jerusalem, Fall 1984. Director, Nazareth Village Research Project, 1998-present. Reports include: First Century Nazareth: A Preliminary Model for On-going Research (1999); The House: Its Structure as a Living Space (1999); The Synagogue in the First Century CE: Recommendations for the Reconstruction of an Academically Defensible Synagogue in Nazareth (2000); Household Furnishings: a Preliminary Report (2000); The Olive Press in the First Century (2002); Surveys and Excavations at the Nazareth Village Farm, 1996-2002 (in preparation). Editor, The Dead Sea Libraries: Student’s Edition, in preparation. (A practical edition including the vocalized, reconstructed text, based upon readings from numerous manuscripts, divided by sense- units according to chapter and verse, accompanied by a parallel English translation and critical notes). Editor, The Comprehensive Concordance to the Dead Sea Scrolls, in preparation. Contributor, The Comprehensive Aramaic Lexicon, J. Fitzmyer, D. Hillers, and S. Kaufman, eds., in preparation. Contributor, CATSS Project: “The Alignment of the Aramaic and Greek Texts of Ezra and Daniel”, l982-1983; Prof. E. Tov, Project Director. Co-author (in collaboration with Click! Multimedia, Inc., Tel Aviv, Israel), A Disciple’s Diary (Palphot and Thomas Nelson/Word, 1996). Contributor , Encyclopedia Judaica (electronic version) (in press). ‘Reassessing Qumran’s Calendars’ Enoch and Jubilees (ed. Pierpaolo Bertalotto and Todd Hanneken): Short papers from the Fourth Enoch Seminar at Camaldoli (8-12 July 2007) in Henoch 31/1 (2009) 104-110. ‘Surveys and Excavation at the Nazareth Village Farm (1997–2002): Final Report’ (with the collaboration of R. Voss and Y. Rapuano). Bulletin of the Anglo-Israel Archaeological Society 25 (2007) 11-71. ‘Lots’, Encyclopedia Judaica (New York: Keter and Macmillan Publishers, 2006). ‘Nazareth’, Encyclopedia Judaica (New York: Keter and Macmillan Publishers, 2006). ‘Sundial’, Encyclopedia Judaica (New York: Keter and Macmillan Publishers, 2006). The Dead Sea Libraries: Student’s Edition, in preparation. (A practical edition including the vocalized, reconstructed text, based upon readings from numerous manuscripts, divided by sense-units according to chapter and verse, accompanied by a parallel English translation and critical notes). ‘Educational Suite and Database on Qumran, The Dead Sea Scrolls and the History of the Second Temple Period.’ (With the collaboration of Stephen Pfann, Jr.) In Bio- and Material Cultures at Qumran: Papers from a COST Action G8 Working Group Meeting Held in Jerusalem, Israel on 22-23 May 2005, ed. Jan Gunneweg, Charles Greenblatt, and Annemie Adriaens, 251-264. Stuttgart: Fraunhofer IRB, (2006). “Historical Implications of the Early Second Century Dating of the 4Q249-250 Cryptic A Corpus.” In Things Revealed: Studies in Early Jewish and Christian Literature in Honor of Michael E. Stone, ed. Esther G. Chazon, David Satran, and Ruth A. Clements, 171-186. Journal for the Study of Judaism Supplement Series 89. Leiden: Brill, 2004. ‘Kelei Dema‘: Tithe Jars, Scroll Jars and Cookie Jars.’ Proceedings of the Manchester Copper Scroll Conference, edited by George J. Brooke and Phillip R. Davies. JSP Supp. Seroes 40. Sheffield Academic Press (2002) 163-179. ‘”313c. 4QcryptA Calendrical Document B,” “317. 4QcryptA Lunisolar Calendar,” “324d. 4QcryptA Liturgical Calendara,” “324e. 4QcryptA Liturgical Calendarb,” “324f. 4QcryptA Liturgical Calendarc?” “324g. 4QcryptA Calendrical Document F?” “324h. 4QcryptA Calendrical Document G?” “324i. 4QcryptA Mishmarot J”.362. 4QcryptB Unidentified Text A,” “363. 4QcryptB Unidentified Text B,” “363a. 4QcryptC Unidentified Religious Text,” “363b. 4Qcrypt Miscellaneous Texts”.’ In Wadi Daliyeh II: The Samaria Papyri from Wadi Daliyeh and Qumran Cave 4.XXVIII: Miscellanea, Part 2, ed. Douglas M. Gropp et al., Pls. XLI-XLIII. DJD 28. Oxford: Clarendon, 2001. The Synagogue in the First Century CE: Recommendations for the Reconstruction of an Academically Defensible Synagogue in Nazareth. University of the Holy Land Press (Jerusalem: 2000). Produced with the collaboration of V. Hillel. ‘Archaeological Surveys’, Encyclopedia of the Dead Sea Scrolls. (New York: Oxford University Press, 2000). ‘Sons of Dawn’, Encyclopedia of the Dead Sea Scrolls. (New York: Oxford University Press, 2000) 891. ‘249. Midrash Sefer Mosheh, Discoveries in the Judaean Desert XXXV (1999) 1-24; pls. I-III. First Century Nazareth: A Preliminary Model for On-going Research. University of the Holy Land Press (Jerusalem: 1999). Produced with the collaboration of V. Hillel. The First Century House: Its Structure as a Living Space. University of the Holy Land Press (Jerusalem: 1999). Produced with the collaboration of V. Hillel. ‘The Essene Yearly Renewal Ceremony and the Baptism of Repentance’, Proceedings of the Provo Conference on the Dead Sea Scrolls, July 1996 (Leiden: Brill, 1998) 337-52. ‘La publication des fouilles de Qumrân et Aïn Feshkha (en édition anglaise)’, Le monde de la Bible 107 (1997) 9. ‘The Wine Press (and Mikveh) at Qumran’, RB 101-2 (1994) 212-14. ‘History of the Judean Desert Discoveries’, Chapter 4 in The Dead Sea Scrolls on Microfiche: A Comprehensive Facsimile Edition of the Texts from the Judean Desert (in collaboration with Emanuel Tov). Brill/IDC, 1993. ‘Khirbet Kerak Ware’, Anchor Bible Dictionary, Doubleday, 1992. Periods, (Jerusalem: Center for the Study of Early Christianity), 1990. Contributor, The Illustrated Dictionary and Concordance to the Bible, Jerusalem Publishing House/MacMillan Press, 1986. ‘A Concordance to Ugaritica VII’, in Ugaritic Studies 2, P.C. Craigie, ed. (originally published in Newsletter for Ugaritic Studies 22 [l980], pp. 8-l6). Evangelical Theological Society, 2001 to present. American Schools of Oriental Research, l977 to present. Society of Biblical Literature, l974 to present. American Association for the Advancement of Science, l968-l972.